DETAILS Using 8 1/2 by 11 red construction paper, fold the eleven inch side in half. Paper now measures 8 1/2 x 5 1/2. Fold in half again. Paper now measures 8 1/2 by 2 3/4. Fold once more. You've now folded in one direction three times. Open the paper. Using the fold lines as reference, accordion fold the paper - i.e. back and forth. When finished fold in half. What you have now is approximately 1 3/8 by 4 1/4 in size. Put fold side on the left and lightly draw the heart shape you wish as illustrated in the drawing above the chain. 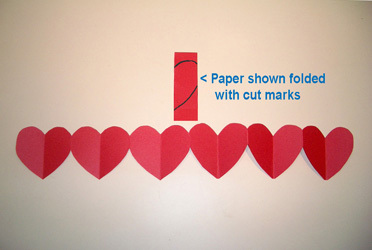 If you use the whole length of folded paper you're going to have a long, skinny heart. Shorter is plumper. Don't cut the edge marked by the arrow, that's where things join. To make a longer chain glue or tape groups together. USES: Hang to mark the days until Valentines Day, removing one heart as each day passes. Or when your grandchild comes to spend the night, hang a chain on their door. Or use on a birthday package instead of ribbon. Be creative! MATERIALS NEEDED Red construction paper, scissors, glue/tape. crayons, markers etc. if you want to decorate your hearts. SKILLS NEEDED Manual dexterity, skill with scissors. it easier to create pretty, plump little hearts.